Usually Ships in 1-5 Days. Please note that sometimes a book is available on our website but not currently on the store shelves. From the author of Strange Weather in Tokyo comes this funny, heartwarming story about love, life, and human relationships that features a delightfully offbeat cast of characters. Objects for sale at the Nakano Thrift Shop appear as commonplace as the staff and customers that handle them. But like those same customers and staff, they hold many secrets. If examined carefully, they show the signs of innumerable extravagancies, of immeasurable pleasure and pain, and of the deep mysteries of the human heart. Hitomi, the inexperienced young woman who works the register at Mr. Nakano's thrift shop, has fallen for her coworker, the oddly reserved Takeo. Unsure of how to attract his attention, she seeks advice from her employer's sister, Masayo, whose sentimental entanglements make her a somewhat unconventional guide. But thanks in part to Masayo, Hitomi will come to realize that love, desire, and intimacy require acceptance not only of idiosyncrasies but also of the delicate waltz between open and hidden secrets. Animating each delicately rendered chapter in Kawakami's playful novel is Mr. Nakano himself, an original, entertaining, and enigmatic creation whose compulsive mannerisms, secretive love life, and impulsive behavior defy all expectations. Bestselling author Hiromi Kawakami has won acclaim for her essays, stories, and novels. Her short fiction has appeared in English in The Paris Review and Granta. Her novel Strange Weather in Tokyo was shortlisted for the 2013 Man Asian Literary Prize and the 2014 International Foreign Fiction Prize. She lives in Japan. Allison Markin Powell is a literary translator and editor in New York City. Her translations include works by Osamu Dazai, Fuminori Nakamura, and Kanako Nishi, and she was the guest editor for the first Japan issue of Words Without Borders. She maintains the database Japanese Literature in English at www.japaneseliteratureinenglish.com. "Kawakami lavishes attention on quotidian minutiae and exquisitely awkward pauses, ending scenes on maddeningly unresolved but vibrant images. [...] It feels a lot like daily life in Tokyo, but odder." "[Kawakami] knows she doesn't need fireworks to keep the reader entertained, and is pushing her exploration of form and style." "A window into another world is opened by this pleasant but sprightly look at daily life in a small thrift shop in a Japanese city. Love and disappointment, professional rivalry, filial conflict and longings for another life illuminate these characters who became friends to the reader by the finish. Great summer read." "Charming, quirky, and wise, this is a warmhearted character study of the undervalued, the obsolete, and the hidden gems among us all." "Subtle, graceful, wise and threaded on a quirky humour, this exploration of the connections and disconnections between people kept me smiling long after the last page." "The Nakano Thrift Shop is really a love story, albeit a very offbeat one... A gentle book, full of charm [and] radiating leftfield charisma." 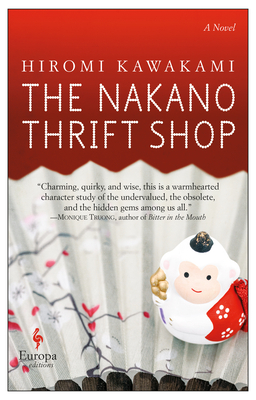 "Hiromi Kawakami's charming novel illuminates moments of kindness, love and friendship that pop up like the unexpected treasures amid the shop's dusty collection of pretty mismatched bowls and plates, castoff eyeglasses, task lamps and old electric fans." ". . .[A] modern Japanese slice-of-life drama." "Readers will grow to care about these quirky characters [...] making “Nakano” an utterly charming little book." "A window into another world is opened by this pleasant but sprightly look at daily life in a small thrift shop in a Japanese city. Love and disappointment, professional rivalry, filial conflict and longings for another life illuminate these characters who become friends to the reader by the finish."